proCertum SmartSign is an application designed for signing documents with electronic signature and signature verification. 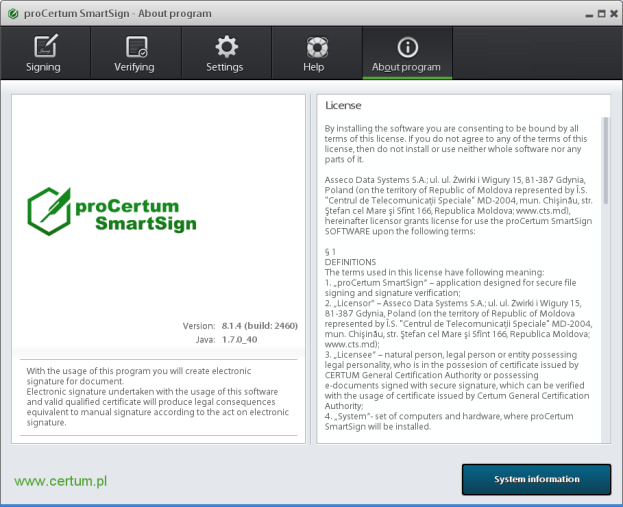 proCertum SmartSign can be an element of secure device in accordance with the Polish Act on Electronic Signature from 18 September 2001. The application proCertum SmartSign makes possible signing and verification of electronic signature n accordance with the European Commission Decision No. 2011/130/UE of 25 February 2011 on the establishment of minimum requirements for cross-border processing of electronically signed documents by the competent authorities in accordance with Directive 2006/123/EC of the European Parlament and the Council on services in the internal market. Additionally proCertum SmartSign application can use authentication module SAM (Secure Application Module). fulfills requirements for signing program in accordance with Regulation of the Council of Ministers of 7 August 2002 on defining technical and organizational conditions for qualified issuers providing certification services, certification policies for qualified certificates issued by those subjects and electronic signature verification as well as technical conditions for secure devices designed for signing and verifying of electronic signature (Dz. U. No. 128, item 1094, of 12th September 2002). Cryptographic card reader, cryptographic card as well as software managing operation of readers are required only in case of signing process with qualified signature. 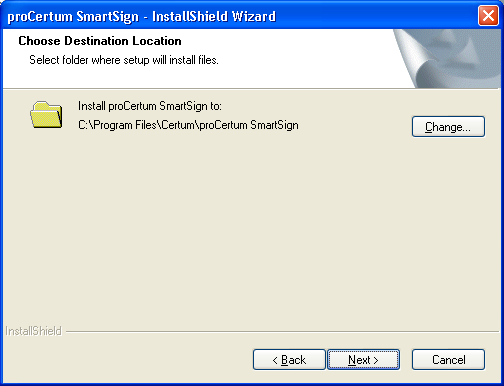 To get the proCertum SmartSign application started, it should be installed correctly in the system. 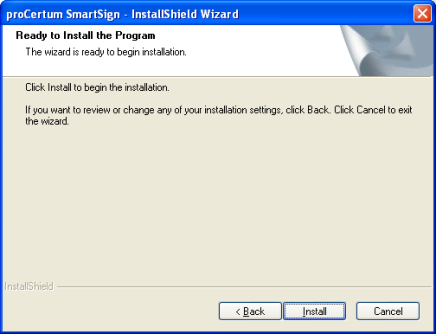 For this purpose double click proCertum SmartSign.exe file icon. After the language is selected, click Next >. The application installation starts. Welcoming window of installation wizard will be displayed then. After you have clicked Next > read the license agreement in the installers window. After you have read the conditions, you must click on I agree to License agreement conditions and then click Next >. Otherwise (after choosing an option I do not agree to License agreement conditions) license terms and conditions will be refused and further installation will not be possible. The next step will be the selection of the location, where the files of proCertum SmartSign application should be installed. Defaults to: C:\Program Files\Unizeto\proCertum SmartSign. If we would like to change final destination click Change… and set new final location. After choosing final location click Next >. Installer has been configured and is ready for installation of application. Window 7: The installation process has been successfully completed. 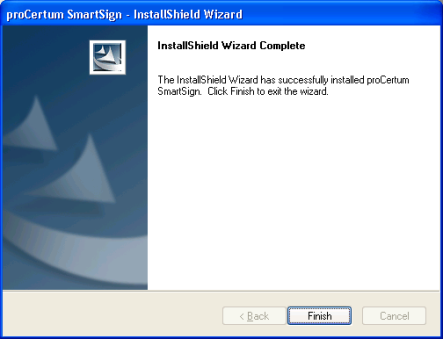 Clicking Finish closes proCertum SmartSign application installation wizard. 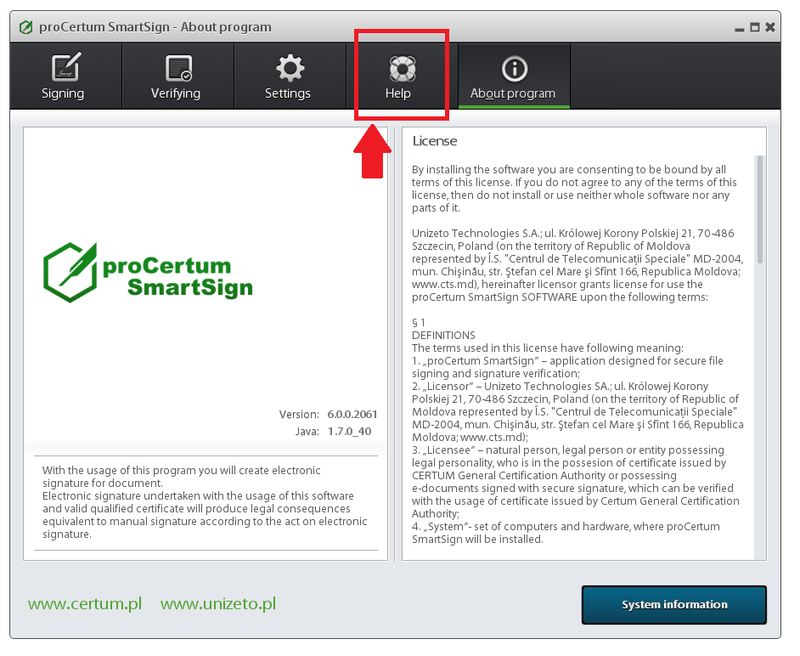 To get the application started, click proCertum SmartSign icon, which is available on desktop or in the menu Start > Programs > Unizeto > proCertum SmartSign. proCertum SmartSign is an application designed for signing documents with electronic signature and signature verification. 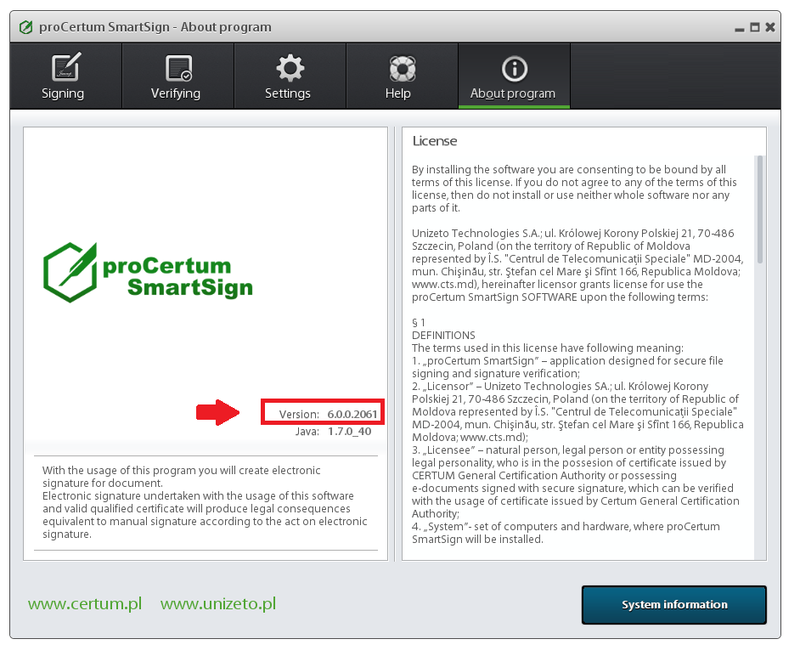 proCertum SmartSign can be an element of secure device for signing with electronic signature in accordance with the Polish Act on Electronic Signature from 18 September 2001. About Program – information about version of software and user’s license. There is a System information button in welcoming window and About Program window. Clicking this button causes displaying window, which contains information about environment, in which the application has been started. 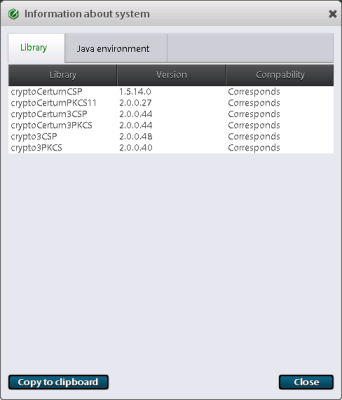 The list of libraries designed for cryptographic card operation is being presented in Libraries tab of this window. Application possesses embedded verification mechanism of these libraries and in case of incompatibility, the information about that will be displayed in Compatibility column. Verification takes place during every start of application. In case of incompatibility of any of libraries, the user will be informed about that. 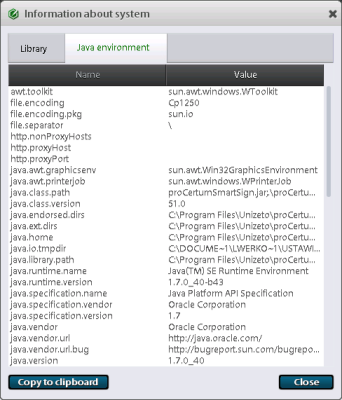 The window containing information about Java environment, in which the application works, is presented in Java Environment tab. For assistance in the use of the application, click the Help button. • The first steps – information on the hardware and software requirements, installation process, the first run the application, etc. • I need support – information for obtaining a telephone or e-mail support. When you select a help topic, you will be redirected to the relevant section on the website www. General tab enables configuration of Proxy settings as well as turning on and off automatic update check. Update – after selecting an option Check update automatically, the mechanism enabling application updates reporting will be started. The mechanism will be invoked while starting of application. Additionally there will be a possibility manual check, if there are any updates available, by clicking Check now. 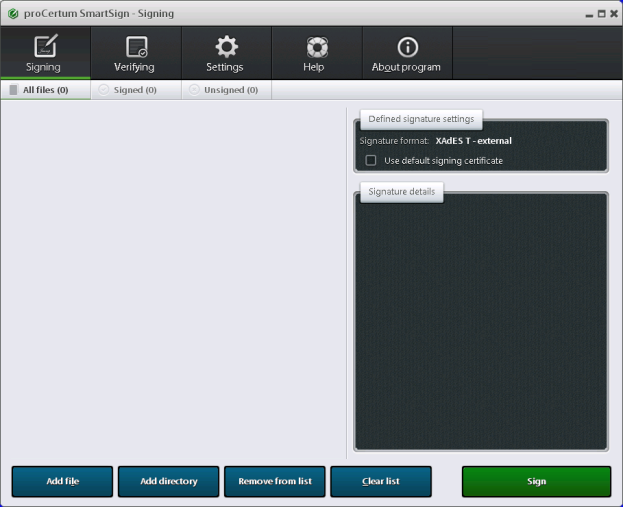 Signature tab enables settings configuration for signing process, which is being realized in Signing tab. ETSI – Electronic signature in ETSI format is in accordance with requirements of The Polish Act on Electronic Signature of 18 September 2001. It is an older electronic signature format. 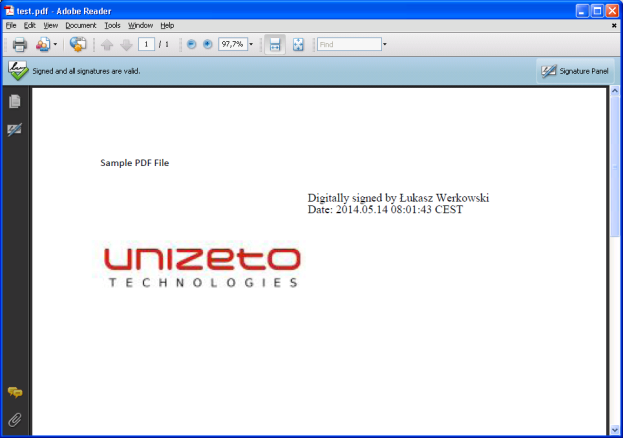 Internal signature – signature file will contain document’s content. Create subfolders in YYYY.MM.DD format – selecting this option that in the folder which is set to create subfolders for signed files in the format YEAR.MONTH.DAY created on the basis of the current date. Default certificate – this option allows you to select which will be the default certificate used to sign the certificate. Remove certificate – by pressing the button the certificate will be removed from the configuration. Before signing the signature ask for a reason – selecting this option, before signing the application will present a window for selecting reason of signature, which will be located in the structure of signature and will be presented later in the properties of the signature. The path to the file signature policy – indicates the path to the signature policy defining the criteria for submitting and verifying the signature. Selection of the appropriate signature policy is made by pressing the button Browse. The Remove button allows you to remove the selected policy and return to the default setting. The path to the file signature policy – indicates the path to the signature policy defines the criteria for submitting and verifying the signature. Selection of the appropriate signature policy is made by pressing Browse. The Remove button allows you to remove the selected policy and return to the default setting. Include a graphic symbol of the signature in the PDF document – selecting this option, during the signing of PDF files for each file will be possible to an indication of an image file to use as a graphic symbol of the signature. Verification tab enables settings configuration for the verification process realized in Verifying tab. Selecting Qualified signature verification will cause setting proper runtime mode of proCertum SmartSign application, which consists in verifying, if the signature operation has been completed with the usage of qualified signature in accordance with the act on electronic signature. If you have selected Qualified signature verification, the application will check if signing certificate is qualified certificate. If it appears that the certificate is not qualified certificate, error message will appear. If data are enclosed in signature file and the user will select an option Export data, if they are included in the signature file, it will cause data separation and data saving in the chosen place. Timestamp tab allows you to configure settings for time-stamping operations undertaken during the submission or verification of electronic signature. Signing tab enables signing file with an electronic signature. Defined signature settings – information about signature format (ETSI/XAdES as well as about signature type: internal/external). Signature details – information about signature dotyczące podpisu. Pojawiają się one po wykonaniu podpisu. Information – Statistic information about the quantity of selected files with the division to files designed for files to sign, already signed files as well as files, which haven’t been signed yet. on group of files – by multiple file selection with the usage of Add directory. Indicated files will be added to the list of elements to sign. To remove file(s) selective from the list to sign please show chosen file(s) and click Remove file(s) from the list. To remove all files from the list of elements to sign please click Clear list. If all elements to sign are on the list, please click Sign. proCertum SmartSign application will find certificates enabling signing documents with an e-signature. After searching has been completed, the certificates will be displayed. Qualified certificates will be displayed in dialogue window. To display all certificates available on given computer, please select an option Show only qualified certificates. To execute signature operation, please show certificate and click OK. If the user has selected qualified certificate for signature operation, reminder, referring to insertion of authentication PIN code will be displayed. Please enter the PIN then and click OK. If entered PIN is invalid, proCertum SmartSign application will search for keys associated with the certificate. After that the signing process will be started. After the signing process has been successfully completed, the summary will be displayed. Signature details section on the tab Signing will be updated with the information concerning signature file (field Signature) as well as signing file (field Signer). For multiple signature, please click Add signature button. 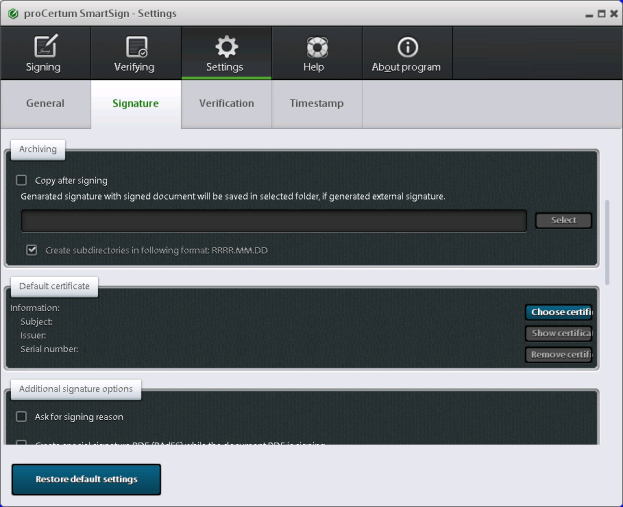 In case of selecting an option Replace signature, all already existing signatures will be replaced with one. 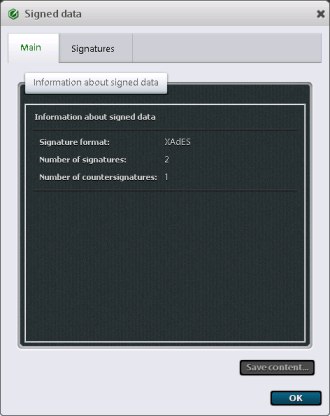 Data informing about already existing signature can be displayed by clicking Show signature. 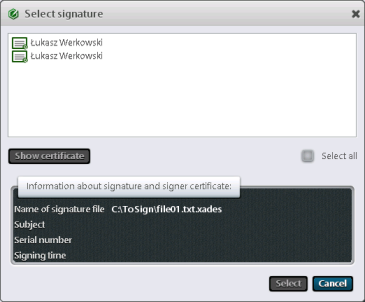 After the signature has been performed, you can check all signatures of the given file by clicking Show signature. To perform countersignature please select file (original, signature file should not be selected), which was signed at least once. Please click Sign button then. Certificate selection and entering PIN code is similar like by single signing. After the proper PIN code has been entered, the following window will appear. After the certificate has been selected, please click Select. 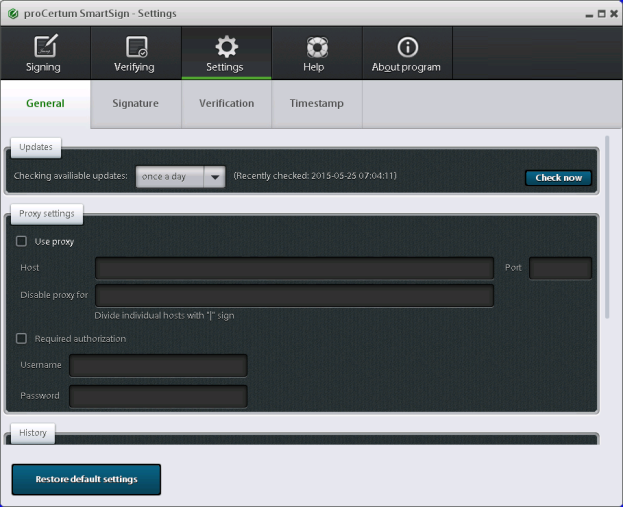 After the signature has been performed, all signatures of given data can be checked by clicking Show signature. If enabled signature is set Create a special PDF (PAdES) when the signed document is PDF document, application for an ensemble is made of the signature of the PDF file in a PDF file so called PAdES format. The process of signing is no different essentially from the process described above. The signature is placed directly in the PDF. For the correct interpretation of signatures in PDF files is required Adobe ® Reader ® at least version 10.0. If in advanced options, of signature PDF / PAdES option Place graphic symbol of signature in PDF document is selected when signing a PDF file, after selecting the signing certificate it will be made possible to select the graphic file signature symbol In the case of serial signing of PDF files for each of signing a PDF file application allows you to define a specific symbol. After pressing the Choose button it will be enabled to display a graphic file used as a graphic symbol of signature (acceptable formats are jpg, gif and png). After selecting the file, the main window will be updated with the selected file. The field in which the graphic symbol is to be placed on the document indicates the mouse while holding the left mouse key. After defining symbol of this field with information on signing will appear in the document. After confirmation with OK the signature is made. After opening the PDF document with a signature graphic symbol will be immediately visible. 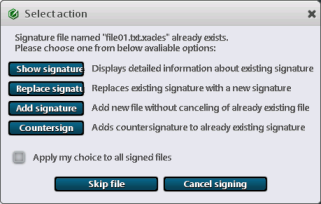 Sign all – after this option has been selected, the signature will be performed on all files available in the list. Sign selected – after this option has been selected, the signature will be performed only on selected files. To select more than one file, please hold left Ctrl button and by clicking left mouse button select next file(s). Add file – this option works in the same way as Add file button. Add directory – this option works in the same way as Add directory button. Remove from list – this option works in the same way as Remove file(s) from list button. Clear list – this option works in the same way as Clear list button. Send as e-mail – This option starts the mail program to the operating system as the default, and generates an email attaching to it signatures of the created files and the files signed (in the case of external signatures). Open file location – this option allows you to display folder of the file. Verifying tab enables electronic signature verification. List of elements to verify – file names are displayed on the list, modification date, size and status of signature (To verify/Verified successfully/Verified unsuccessfully). Defined signature settings – information about verification settings referring to qualified signature verification (See: point 4.1.3). Signature details – information referring to signature on selected file. Information – statistic information about the number of selected files with the division to files designed for files to verify, already verified files as well as files, which haven’t been verified successfully. on group of files – by multiple selection of file with the usage of Add file button or by adding directory with the usage of Add directory button. Selected files will be added to the list of documents to verify. To remove file(s) selective from the list to verify, please indicate selected file(s) and click Remove file(s) from list. To remove all files from verification list, please click Clear list. Indicated files will be added to the list of elements to verify. To remove file(s) selective from the verification list, please indicate selected file(s) and click Remove file(s) from list. To remove all files from verification list, please click Clear list. Files with internal or external signature (information about signature is found in the Signature information section) can be found in the list of elements for verification. If selected element is an external signature, please select source file in the Signature information section, on which the signature operation has been performed. It should be done by clicking button. Detailed information can be inquired by clicking Show signature button. Signed data window will be displayed then. 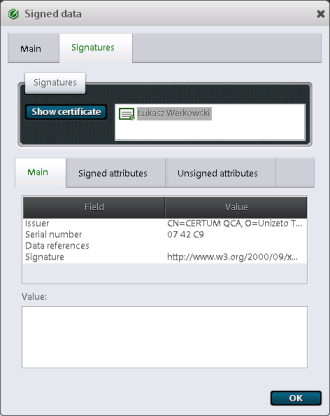 Signatures – contains information about signature and signer certificate, signed and no-signed attributes etc. To display the document, which is being verified, please click Show document button. Document is being displayed out of control of proCertum SmartSign application, with the usage of external application, which is proper for this document type. If all the elements for verification are found on the list, please click Verify. The signature verification process starts. After the e-signature verification process has been completed, the summary will be displayed. If the verification process is defined as successful, the entry Certificate: Jan Kowalski – successfully verified will be shown in Verification status field in section Signature information. If the status of verification process is defined as unsuccessful, the element will be marked with red and there will be an entry Certificate: Jan Kowalski – verified incomplete, displayed in Signature information section in Verification status field. Error reason for the signature file will be also given in the Verification status field. Verify all – after this option has been selected, signature of all files found on the list will be verified. Verify selected – after this option has been selected, the signature will be verified only for selected files. To select more than one file, please hold left Ctrl button and by clicking left mouse button select next file(s). Remove file(s) from list – this option works in the same way as Remove file(s) from list button. 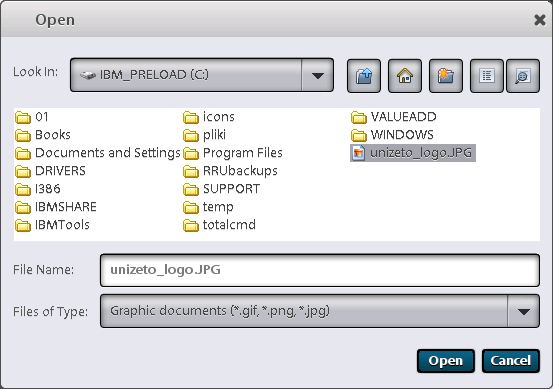 Open file location – option allows you to display folder of the file. 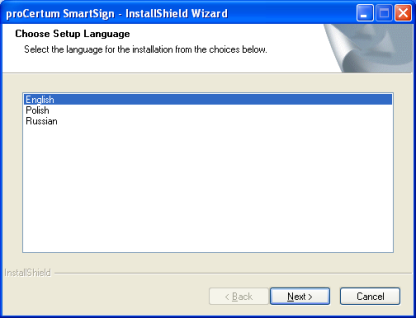 Sign – after this option has been selected, proCertum SmartSign application with selected Signing tab will be started and marked file will be loaded to the list of files designed for signing. Further signing procedure is described in 4.3 point. Verify – after selecting this option, proCertum SmartSign application with selected Verifying tab will be started and marked file will be loaded to the list of files designed for verification. Further verification procedure is described in point 4.4. 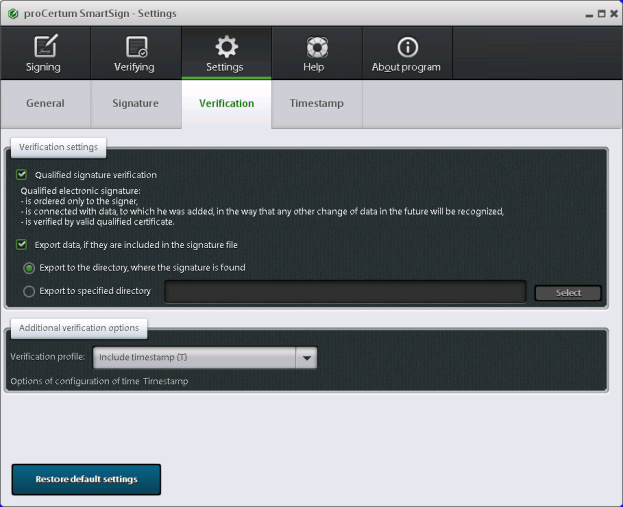 Show signature – after selecting this option, Signed data will be displayed with the usage of mechanisms included in proCertum SmartSign application. This option is available only for signature file. There is an update reporting mechanism included in proCertum SmartSign application, which will be activated by marking proper option in application general settings. The mechanism starts while getting the application started. After clicking button Yes, the www page window will be opened, where you can download the latest version of application. To make the mechanism work, the computer has to be connected to the Internet. 1. How can I add the information that a document has been signed electronically? The proCertum SmartSign software enables adding a graphic signature symbol while signing PDF documents. 2. Where from can I download proCertum SmartSign (signing software)? 3. How can I view and save the contents of a document signed electronically? 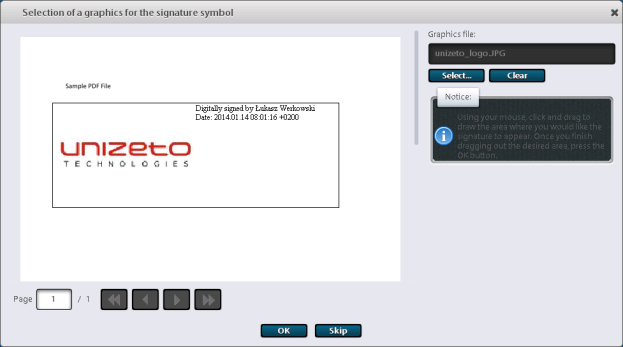 The proCertum SmartSign software enables viewing the signed file just after it has been signed. To do so, please click: „Show the document” button. 4. Why is there one additional file created while signing a document? Should it be sent to the recipient so the document is appropriately verified? Signature type – external signature. What files should be sent to the recipient for an appropriate verification to be performed? 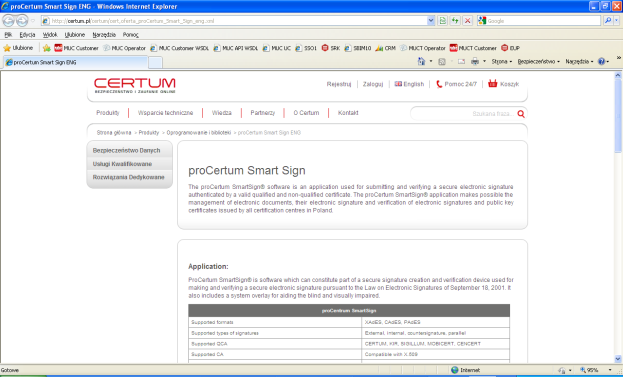 and the signature file additionally created by proCertum SmartSign. 5. How should I use time stamps in the proCertum SmartSign software? 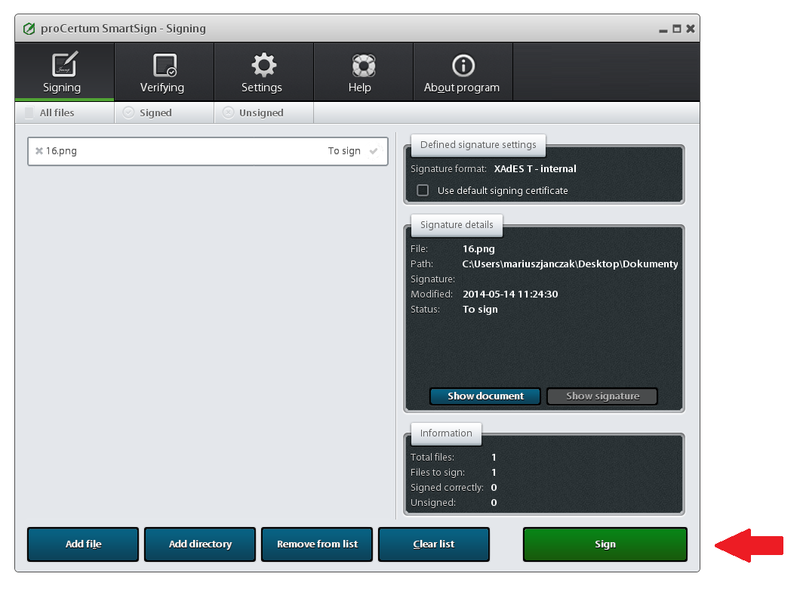 The proCertum SmartSig software settings should be set appropriately to use time stamps. 6. How can I sign a document? 7. How does the option for the blind work? With Java Access Bridge technology the proCertum SmartSign application is adjusted to the requirements of screen-reading software, e.g. JAWS, NVDA. 8. What are the language versions? 9. What size files can be signed? CA dES (internal and external signatures) and XA dES (external signature) in a 4.5GB file. XA dES (internal signature) can be successfully performed in binary files up to 80MB, and in *.xml files up to 25MB. 10. 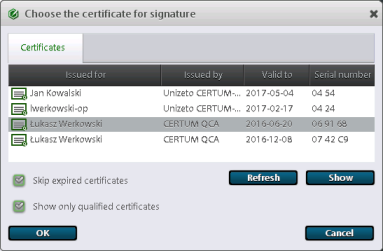 How many files can be signed at one go in proCertum SmartSign? Moreover, it is recommended not to exceed 10,000 files of 50KB while signing at one go. 11. What certificates are supported by the application (of what companies)? 12. Can I place a graphic signature while signing? 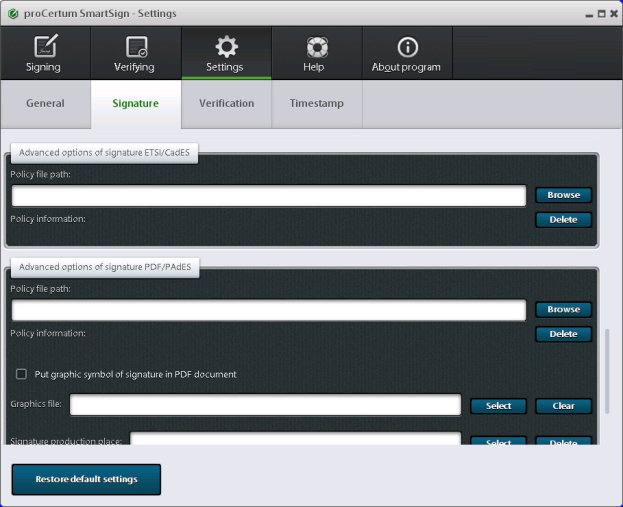 Yes > The proCertum SmartSign software enables adding a graphic signature symbol while signing PDF documents. 13. How can the option „certified to be a true copy” be marked in a document being signed? 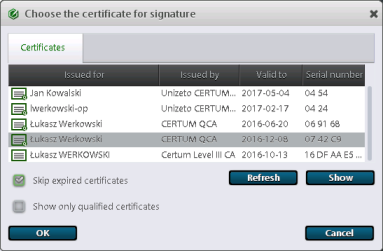 In the proCertum SmartSign software it is possible to add a signature justification – selecting this option will cause the application to present a window in which an option for signature justification can be selected. The signature justification will then be placed in the signature structure and displayed in the signature properties. How can I enable the option „Before signing ask for a signature justification”? „Before signing ask for a signature justification”. While signing it will be possible to add a justification for signing a document. 14. Is it possible to run a program from the command line? Yes > it is possible to run the proCertum SmartSign application from the command line using appropriate arguments, e.g. proCertumSmartSign.exe –sign. Note: while running the application from the command line and using a parameter to sign a document, GUI will always be displayed. 15. What is the difference between internal and external signatures? Where can I set those options? External signature – the signature file does not include the contents of the document being signed; it includes information on the signature only. Note: Please remember that while signing, a signed document together with its signature should be delivered. Internal signature – the signature file includes the contents of the document being signed together with information on the signature. How can I set the signature type to external/internal? 16. How can I set signing in the Pades format? Go to „Additional signature options” and select the „Create a special PDF signature (PadES) while signing a PDF document” option. 17. 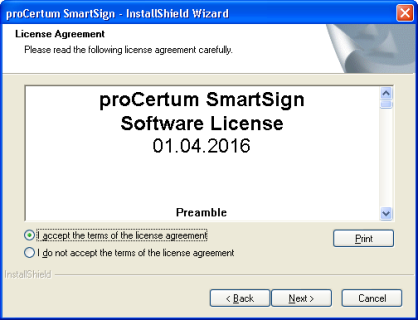 How can I check what proCertum SmartSign software version I have? 18. Can I sign several documents at one go? YES > The proCertum SmartSign application enables signing several/several hundred documents at one go. 19. How can I check whether a signed document includes a time stamp? Go to the „Signature” tab and select the „Unsigned attributes” tab, which includes information on whether a time stamp has been used. 20. How will I know that I have used up the limit of stamps? 21. Where can I find instructions on signing and verifying a document? 22. Can two people sign the same document in SmartSign? 23. Does SmartSign sign PDF and doc files? 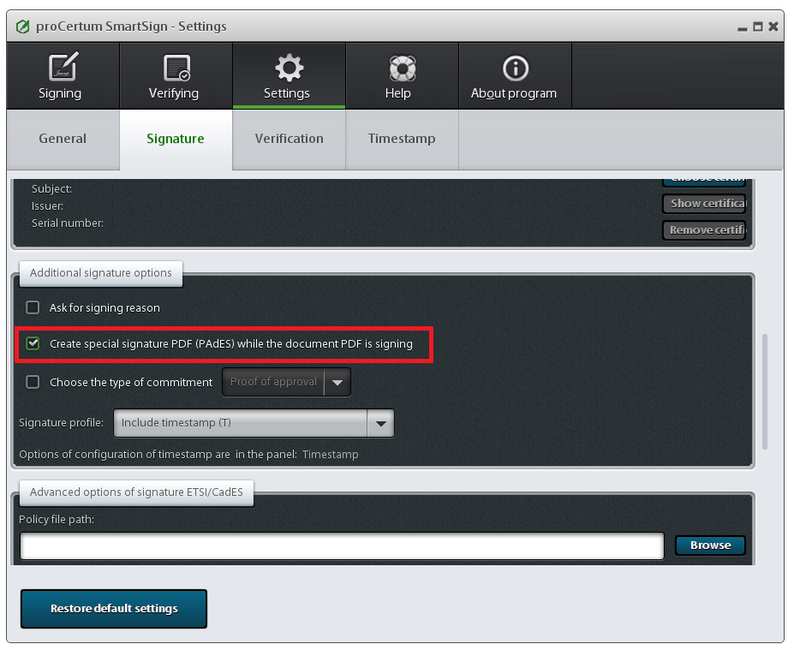 YES -> The proCertum SmartSign application enables signing PDF, doc files and more.